While making a presentation recently at the Oakland Space and Science Center in California, the topic of fiberglass versus spray foam insulation came up and was quickly followed by questions about hybrid insulation systems. It seems like a lot of people have hybrids on their mind these days. One of the positives about spray foam is that the insulation itself is air resistant. The gas or air which does the majority of actual insulating is trapped in bubbles inside the plastic foam matrix and can’t be washed out by air flow. Now that we recognize the influence of air leakage on a home’s energy consumption, many builders and homeowners are trying to get their houses as “tight” as they can. Installing spray foams where air is leaking through the building envelope can reduce that flow rate. One of the issues people struggle with when considering foams as a solution has been their cost- they can have a significantly higher installed cost than fibrous insulations. For this reason, in some markets, contractors are turning to hybrid insulation systems often referred to as flash and batt insulation. To fill a 2 x 6 inch empty wall cavity, first add a flash coat of closed cell foam on the exterior wall to a thickness of 1 -2 inches then take a low density batt to fill in the space before the drywall is installed. What you get is the best of both worlds – the inexpensive high R-value of the fiberglass batt combined with a smaller amount of foam which gives you the air tightening effects desired. An even more effective option is using loose fill insulation such as OPTIMA® in the hybrid system instead of fiberglass batts. This is a cost efficient, high R-value, well performing system. A challenge for the hybrid approach lies in very cold climates. Fiberglass is a very efficient insulating material so if too much is used with the foam it will make the foam cold and moisture can form in the wall assembly. That needs to be avoided at all costs. For colder climates there are very specific recommendations for the amount of foam you need to use in the wall constructions before you can eliminate the need for a vapor retarder on the warm-in-winter side of the insulation. We have recommendations for hybrid insulation systems, as does the Blow-in Blanket Contractors Association (BIBCA), designed to create the appropriate foam to fiberglass ratios which will prevent this from occurring. If you choose to install less foam and more fiberglass or if you have any lingering concerns about moisture in these assemblies, I recommend installing a Smart Vapor Retarder such as the MemBrain™ product. As an example, the First LEED Platinum Home in Colorado applied the hybrid system using CertainTeed products. If you are using a hybrid insulation system in your construction projects I would love to hear your experiences. 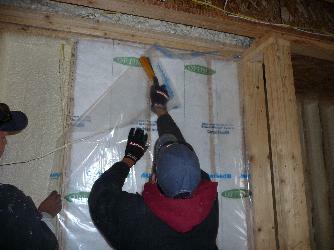 In our climate in Colorado we install a minimum of 2″ of closed cell then fill with fiberglass batt or BIBS. This is what we were informed as far as application in our climate. With the right home maintenance, you will realize and can truly assess in your place needs this kind of insulation system. It would be better also to learn some facts regarding it and how it helps your place become more secure and safe to stay in. I agree with you Jim. The depth of foam is dictated by the climate and the depth of framing. Colder climates and deeper cavities require more foam. We offer specific recommendations for both for assemblies where people do not want to install and additional vapor retarder on the warm side of the fibrous insulation. The flash and batt systems Guardian and some manufacturers were touting a few years back have recently been raising concern about how much foam is needed. You say 1-2″ but I think that varies depending on the climate your working in. Is that correct? I am Very thank full the owner of this blog. Because of this blog is very informative for me.And I say u some thing You make more this type blog where we can get more knowledge. in some markets, installers are turning to multiple insulating material systems often generally known as display and batt insulating material.